The term “Muslim Quarter” may sound misleading, as it’s hard to believe that China has many local Muslims, and yet, nestled in the heart of Xi’an city, a bustling Muslim community has thrived for nearly a thousand years. Muslim Street, also known as Huimin Street, Muslim Snack Street or the Muslim Quarter, is a collective term used for a number of streets in Xi’an, including Beiyuanmen Street, Xiyangshi Street, and Huajue Lane. For the average tourist, it presents a fantastic opportunity to explore Chinese Muslim culture and get a real idea of what daily life is like for a Chinese Muslim. However, for the locals, this is the perfect place to whet their appetites on a balmy summers’ night and enjoy some of the fine delicacies that the Muslim district has to offer. 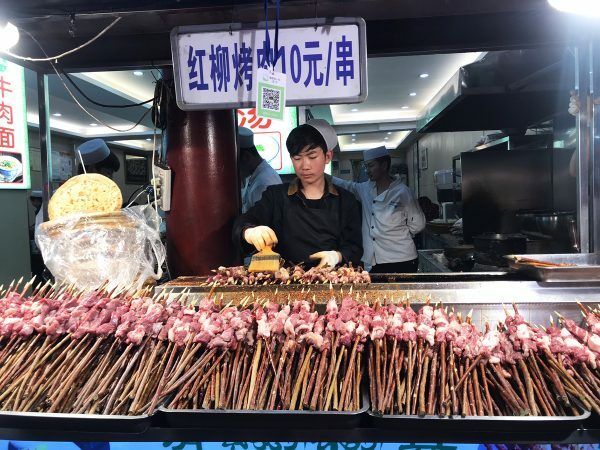 In fact, the area has become famous for its undeniably delicious food, which includes both ethnically Muslim dishes and local Xi’an specialities. But before we get your mouth watering and your stomach rumbling, we’re sure you’d like to know more about how these Muslims came to live in a Chinese city. It all began sometime between 209 B.C. and 9 A.D., during the Western Han Dynasty, when the Silk Road had just been established. The site of Xi’an city was, at the time, the ancient capital city known as Chang’an, which became the starting point for the Silk Road. Many diplomatic envoys, merchants and scholars from Persia or various Arabian countries were able to come to Chang’an thanks to the Silk Road and did so in order to follow various political, mercantile or scholarly pursuits. A number of these Persian and Arabian nationals decided to stay in Chang’an and settled on what is now the present-day Muslim Street. They came to be known by local people as the Hui (回) people. Over time, generation after generation of the Hui people thrived and multiplied, so that now approximately 60,000 Hui Muslims live in Xi’an city. In spite of their currently large population, they still form a very tight knit community thanks partly to their shared ethnicity and predominantly to their religion. Even to this day, there are 10 mosques on Muslim Street where Hui people can go to worship. 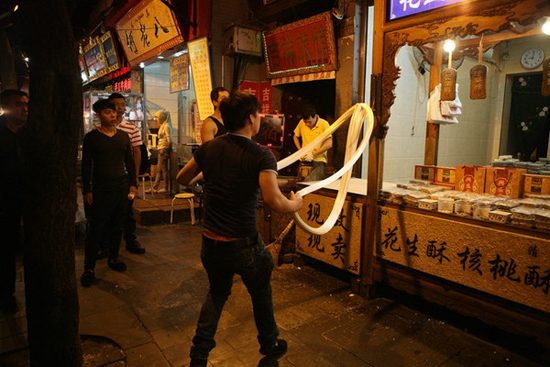 Nowadays, all of the shops and restaurants on Muslim Street are run by Hui people. Muslim Street itself is paved with blue flagstones and shaded on either side by trees, making it a beautiful place to go both day and night. Most of the ancient stores that line the main street of the Muslim Quarter were built during the Ming (1368-1644) and Qing (1644-1912) Dynasties, so their architectural style is typical of that period. There are also a number of famous, ancient buildings in this district, including the Hanguang Gate of the Tang Dynasty, the Xicheng Gate Tower Cluster of the Ming Dynasty, the City God Temple (a Taoist Temple) and the Grand Mosque. Muslim Street is also very close to the Bell Tower and the Drum Tower, meaning it’s the perfect place to relax after a long day of sight-seeing. Yet it isn’t just the streets’ architectural beauty that draws the crowds every night. When dusk falls and the street lamps hanging from the restaurant eaves slowly light up, the Muslim Quarter comes to life. Locals and tourists alike flock there to taste some of the delicacies that Muslim Street has to offer. The two most popular dishes are Roujiamo, a bun filled with marinated mutton or beef that is sometimes referred to as a “Chinese Hamburger”, and Yangrou Paomo, a sumptuous mutton stew with vermicelli served with crumbly, melt-in-your-mouth, handmade flatbreads. Some Chinese celebrities have even gone so far as to say that Roujiamo is the tastiest dish in China! And, if that doesn’t whet your appetite, then we’re sure you’ll succumb to the flavourful Liangpi cold noodles, the meaty Qishan noodles, the delectable soup buns and that irresistible favourite: dumplings. Not to mention that all of these dishes, from the Sun Family’s patented Yangrou Paomo to Wang’s Family Dumplings, are all handmade from recipes belonging to established Hui families that have been passed down for generations. Day or night, the Muslim Quarter is the perfect place to unwind and experience local culture. 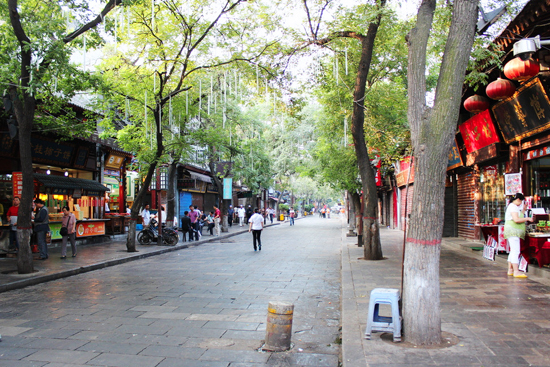 During the day you can immerse yourself in Hui culture by visiting the many markets in the area, in the afternoon you can visit Gaojia Dayuan and partake in one of their traditional puppet shows or shadow plays, and at night you can wander the streets people-watching or sit down to enjoy some delectable local cuisine. With all these tantalizing treats on offer, we guarantee that you simply won’t be able to resist a trip to Muslim Street.